A hazy Sunday morning and though not as bad as it was last Saturday, the PSI reading was at near 100. 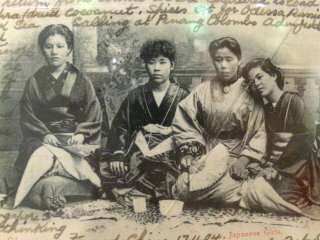 I went in search of the place where the four Japanese girls in this postcard dated 1904, would have stayed when they were in Singapore. Why you may ask then, a postcard from Singapore would have featured the Japanese girls as its attraction. 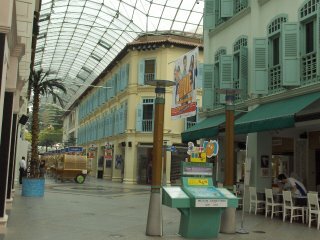 It was early and the shops in the Bugis junction shopping mall, were not open yet and the ‘streets’ were quiet. The overhanging glass roof that protects the shopping mall from the weather did a good job to keep the haze out too. Except for the shop façade which exudes an air of colonial architecture with a straits flavor, one could have imagined this shotengai （商店街 – shopping mall） in Japan. Here you find Aji-sen noodle shop, the Kyoto-soba, and other Japanese restaurants. The shopping mall is the first in Singapore to have a overhang structure which had borrowed the idea from the shyotengai in Japan. I heard that it was no coincidence, for the Japanese developer had wanted to develop the old shop lots in this area akin to the shopping mall in Japan For a century and more ago, this area was indeed called yat bun gai (Cantonese), jitpun goi (Hokkien) (日本街) by the locals. The young Japanese girls were karayuki-san who lodged in the brothels located here. The story of the karayuki-san was a melancholy tale of young women leaving their impoverished villages in the south-western island of Kyushu (九洲) & venturing across the ocean to sell themselves to foreigners, in order to support their family back home. The Japanese term karayuki (唐行), was originally to mean to travel to the Land of the Tang. As what our forefather would call their homeland Tangshan (唐山), the Japanese too referred to China as the Land of the Tang, as culturally the Tang Dynasty left the greatest imprint on Japan. However, from the mid-nineteen century onwards scores of young women from the poor farming and fishing villages of the Shimabara Peninsula and the Amakusa Island went abroad via the nearest port, Fukuoka, and karayuki took on a new meaning from then. And karayuki-san came to mean these women who left for foreign shores in China, Siberia, as far as India and Africa, and to South-east Asia. The majority of these karayuki-san who came to Singapore stayed in the brothels in Xiaopo (小坡), west of the Singapore river - right at where Bugis Junction and the Intercontinental Hotel is located. A survey conducted in 1905, in the vicinity of Malay Street, Malabar Street, Hylam Street and Bugis Street counted 91 Japanese brothels, with close to 500 karayuki-san. These streets no longer exit per se, but are now part of the shopping mall. The area is bordered by Victoria Street & North Bridge Road to the north and south, and Middle Road and Rochor Street to the west and east. At the turn of the 20th century, Singapore had a strong community of Japanese expatriates. When the 1917 Alien Registration Act was enforced, it recorded 1,805 males and 947 females. The majority of the female needless to mention were karayuki-san . 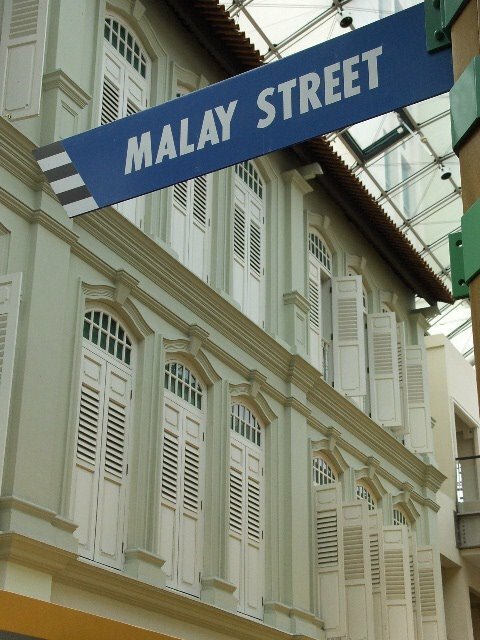 The Japanese then called the Malay Street area, suteresu – a corruption of the English word street. 1. In the layer of history of this area, this area was part of Kampung Glam, named after the Glam tree, whose bark was used in boat work. In Raffles town plan this area was designated a Bugis area. The Bugis were seasoned sea-fearers and brave warriors that roamed the seas of the Malay Archipelego for centuries and they originated from the Sulawesi Island. Subsequently the earliest immigrants from Hainan came & settled here (Hylam Street) and then the Japanese traders and the karayuki-san . In 1921, licensed Japanese brothels in Singapore were abolished. 3. The story of the karayuki-san was popularized in Japan by the novels of Yamazaki Tomoko – 'Sandakan no Hachiban Shokan' & 'Sandakan no Haka'. The author visited Singapore in the 1970’s and was sad to find that the shop houses were in a desolated state of abandonment. I’m not sure if Tomoko has visited the new Bugis Junction and what her impression would be now. There are plates in the shopping mall describing the origins of the Bugis warriors who once settled in this area. However, there no longer is any trace of the karayuki-san, except in the names of the 'suteresu'. Wouldn’t it be good to have a plate too to remember them by, of their sojourn from Amakusa to Bugis Junction. 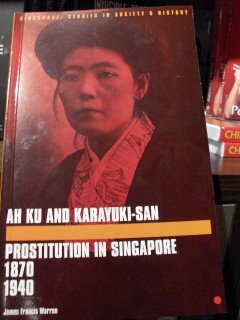 Aku & Karayuki-san, Prostitution in Singapore 1870-1940 by James Francis Warren, published by Singapore University Press, 2003. It seems a misty Saturday morning Oct 7, 2006, 7:55am - atop Mount Sophia., one could hardly see where Bencoolen Street and the NAFA and the surrounding buildings. If not for the smoky smell, one for a while would have thought Singapore had a Genting resort, & enshroud in the clouds. The haze is the worst so far. It was brought in by the south-westerly winds from the forest fire in Sumatra. With this haze coming in from Sumatra, Bengkulu is not so far off anymore. Well near two centuries ago, when our Lady Raffles, whom this hill is named, traveled by sailing ship from Benkulu to Singapore it would have taken her a week and more to arrive here. Bencoolen is the anglicized name of Bengkuku. It is located in south-west Sumatra on the same coastal front that bore the impact of 2004 Tsunami, with the ground zero Melebu located on the north-eastern end. In the days of sailing ship when the Suez canal was not open yet, ships sailing from Europe, round the tip of Africa, across the Indian Ocean to the far east, Bengkulu was a important port of call. Sophia Hull married Stanford Raffles on 22Feb 1817, as his 2nd wife, at age 31, and him 37 years old. When she accompanied Raffles and started on her maiden voyage to Sumatra in Oct of that year she was already a Lady of the Knight. The ship that she sailed on was named after her, Lady Raffles. Raffles was earlier conferred the knighthood on 29 May by the Price Regent for his seminal work on The History of Java. He was on his way to take up the Lieutenant Governorship of Benkulu. The journey by sea from England, round the Cape of Good Hope to Sumatra took five months. The ship anchored off Pulau Tikus, an island off Bengkulu in March 1818. In her letter she wrote that it was just after an earth quake & the houses were badly damaged the previous few days. In the long journey, she gave birth to her first born whom she named Charlotte Sophia Tanjung Segara. (Lotus of the Sea). Why the Malay sounding name you may ask. For the latter name was given by the Java prince on board, Raden Raden Dipura. Raffles was appointed Governor of Java in 1811, and the price had traveled with him back England. Sophia was an adventurous woman. Barely after she had settled on the island and regained herself from the sea sickness, she accompanied her husband to travel the interior of Sumatra, venturing into the Minangkabu territory. She wrote that the natives were so enthralled by the first white woman they saw, they thought she was some divine being. This travel of Raffles was published in The Globe and The Observer in mid January 1819. Shortly after, she again joined Raffles on his journey to Calcutta, the HQ of the East India Company. They left on 2 September 1818 on the brig Udney, and arriving in Calcutta on 29September, Out of this trip was Raffles discussion with the Governor-General Lord Hastings on the establishment of a trading post on the southern tip of the Malay Peninsula to counter the Dutch threat to British trade interest in this south-eastern sea route between India and China. 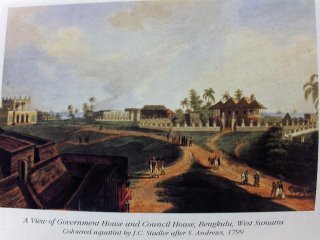 On the return journey from Calcutta, Sophia and her husband de-toured to Pinang, The Prince of Wales Island, and reached there on 31December 1818. She stayed behind on the island while Raffles made his mission from there on board the Indiana that lead to the - founding of Singapore. While in Penang Sophia gave birth to her second child, a boy named Leopold Stanford. She left Penang for Benkulu with Raffles on 22May, and sailing south, they called in at the new found settlement on the island of Singapore. This was her first trip to the island, a dense tropical jungle, with a outpost taking shape at the mouth of the Singapore River. In the four weeks when he was here and before he left on 28June, Raffles gave instructions to Lieutenant Colonel William Farquhar on the management of the new settlement. Her second journey to Singapore was in September/October 1822 by which time the population on the island has grown to 5,000. She stayed till 9June1823 and in the 8 months she was here, Raffles has a wooden house build on Government Hill, aka Fort Canning or Bukit Larangan. In this trip Raffles laid forth the Singapore Town Plan which sets the foundation of the new settlement which is visible till today. Lady Raffles Sophia, wrote the biography of Raffles in Memoir which was published four years after his death. As the saying goes, behind every successful man, is a woman. 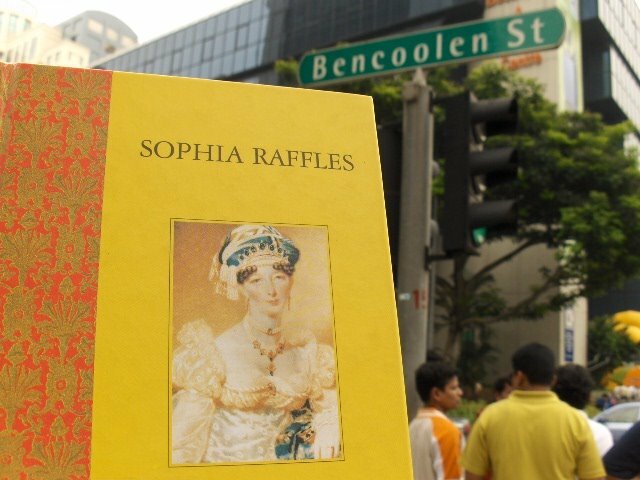 Sophia steadfastly supported Raffles in his days of adventure, joy and sorrow. Raffles first wife was Olivia Fancourt, a widow ten years he senior whom he married in 1805 at the age of 25. She died in 1814 in Bogor as Lady Governess of Java. A marble monument erected by Raffles in her memory at the Botanical Gardens of Bogor stands till today. History feels that Raffles has a greater love for Olivia, though his relationship with Sophia deepened over the years. By a strange coincident his marriages to Olivia and his second wife, Sophia, were for a similar period of nine years.